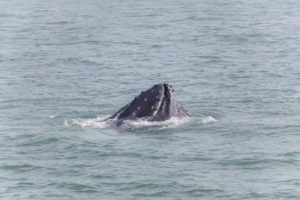 The whale watching season at Hauganes has started incredibly well, with 100% sighting success so far and great weather in our tours. The one thing we have noticed in Eyjafjörður this summer is that the Humpbacks behave a bit different than last year, their usual eating pattern is that they come up to breath for a few minutes and then they go back down to a deep dive and stay there for 5-7 minutes before they come back up to breath. This spring the krill and all their food seems to be at the surface of the ocean, the whales stay at the surface for a few minutes gathering food before they lift their head a bit out of the ocean to eat it all in one bite. 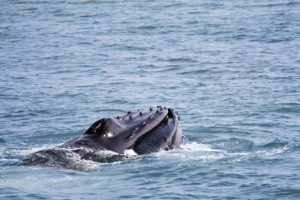 And because Humpback Whales are baleen whales you can see the sea flooding out of their mouth as they use their tounge to filter the food from the sea. We have seen this before but then only for 1 day at a time but now it has been consistent for a week or so. 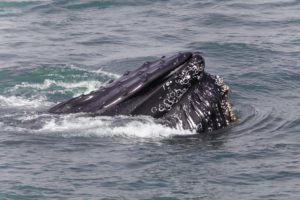 It’s really interesting to see the head of the humpback whales as they come up, it’s filled with barnacles and the mouth is really big! The nature always surprises us with something new and exciting so we are looking forward to these 3 months of whalewatching! 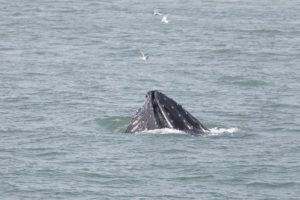 Here’s a cool video of a humpback whale in Alaska eating at the surface.